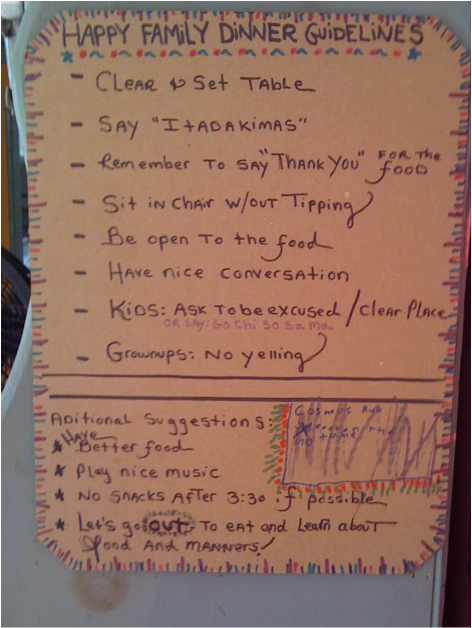 Here is a picture of the Happy Family Dinner Guidelines posted in our kitchen. These guidelines were arrived at by my beloved husband and myself, which just goes to show that a non-cook and a great cook can work well together on things to do with dinner. At the end, we also had some help with the guidelines from the kids. These guidelines are intended to mitigate meal time awfulness caused by the complex, compounded, and amplified dynamics of family life. They are also intended to short circuit pickiness and nip grouchiness in the bud. * NOTES: "Itadakimas" is what is said before eating in Japan. "Gochisosama" means that you are finished.